Strange how August is always colder than July. 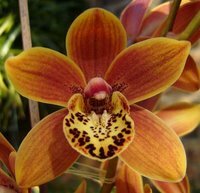 Tropical orchids are quite confused by the cold fronts of temperate climes - some are already well into their spring growing season, whereas others are still slumbering in winter dormancy. This month carries on with the warm colours of the flowers from the previous month. Here are five winter warmers to cheer you up. Dendrobium trigonopus. 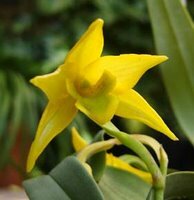 This truly delightful miniature species from South East Asia has bright yellow flowers and an apple green labellum with tiny red striations. 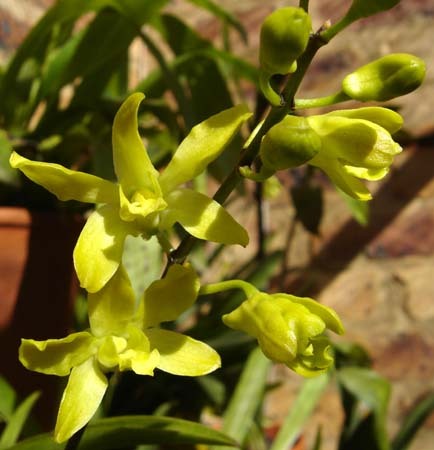 It is also part of the Nigrohirsutae group in Dendrobium, which includes beauties like Den. formosum, Den. infundibulum and Den. cruentum. My plant grows mounted on a small piece of timber which is suspended from the roof of the greenhouse in a cool bright aspect. 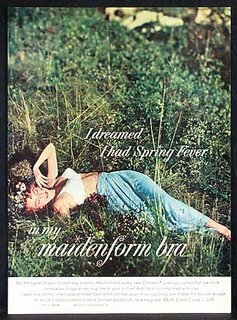 It has a delicious scent that some people say reminds them of honeysuckle. Personally, it reminds me of the smell of a candy shop. Pretty. Cymbidium Kusuda Shining. An exceptional modern compact variety. The inflorescence produces the blooms at large intervals for a Cymbidium, displaying them singly and making the whole appearance less cluttered. Bright yellow labellum with prominent dark chocolate markings makes a nice contrast to the rusty amber petals. The column is a darker, dusty rose colour with a light anther cap. Sunny. 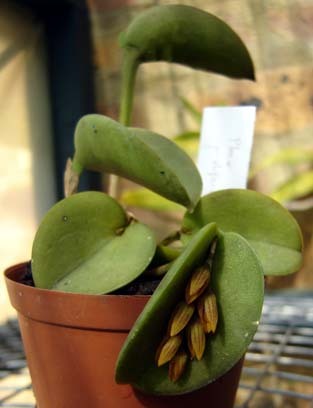 Pleurothallis prolifera. This is a very strange orchid from Venezuela and Brazil. It has coriaceous (i.e. leathery) leaves, quite atypical for its genus and can be found growing lithophytically (that means on rocks, folks) in hot, dry places. Other Pleurothallis are usually found in moist cloud forests, so this one really is the odd one out. Microscopic striped flowers are carried on an inflorescence along the mid-vein of the leaf. Weird. Dendrobium Banana Royal. This plants is sometimes listed as Banana Royale. It has a lot of Den. canaliculatum influence and has to be grown in a warm situation with ample light. A dry winter rest is also required for successful flowering. Indeed, I've struggled for the last couple of years to get it to bloom. The flowers are small and twisted and are the colour of just-ripe bananas. Edible. Laeliocattleya Ronselensis. 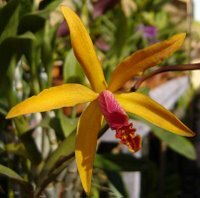 This is a primary hybrid between the dull green Cattleya forbesii and dimunitive orange Laelia cinnabarina. It was first registered in 1904 and again illustrates how the progeny of a cross can be a vast improvement over the parents. This plant carries golden yellow starry flowers with cherry red lips on a tall inflorescence. Perky.